"We are ready to meet the demand and are looking forward to expansion in these key markets." Somnetics International, Inc., the Minneapolis-based maker of Transcend® Sleep Apnea Therapy System™ announced that it received CE Mark and will expand distribution of Transcend to Europe. In October 2011 Transcend received registration approval in Canada. Transcend is the world’s smallest, lightest, and most portable continuous positive airway pressure (CPAP) and battery system. Somnetics recently introduced new options and accessories that make Transcend the industry’s most flexible CPAP system for hassle-free travel and home use. Somnetics received FDA market clearance for the Transcend obstructive sleep apnea therapy device in July 2010. Since then, Somnetics has introduced waterless humidification, lightweight and portable battery systems and accessories to make this the smallest, lightest, most portable and most flexible CPAP and battery system available. Somnetics sells its products through an established network of distributors and direct sales representatives serving markets across the U.S. and in key markets around the world. For information about Transcend visit http://www.mytranscend.com or call 877-621-9626. Somnetics International, Inc. is a privately-held medical device company based in Minneapolis, Minn. It is an emerging leader in customer-driven design, development and production of respiratory medical devices to treat sleep apnea and related issues. Somnetics’ mission is focused on integrating technology, customer input and employee creativity to provide innovative, high quality products that improve quality of life for people with respiratory disorders. Transcend received the Innovation Award at Medtrade in October 2011 and the 2012 Best Practices Award for Product Differentiation in the Sleep Disordered Breathing market from Frost & Sullivan. 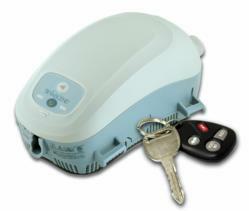 Somnetics received FDA market clearance for the Transcend CPAP machine in July 2010. Transcend and associated technology is protected by several issued and pending US and foreign patents.